3PO and R2-D2 traverse the scorched sands of Tatooine. 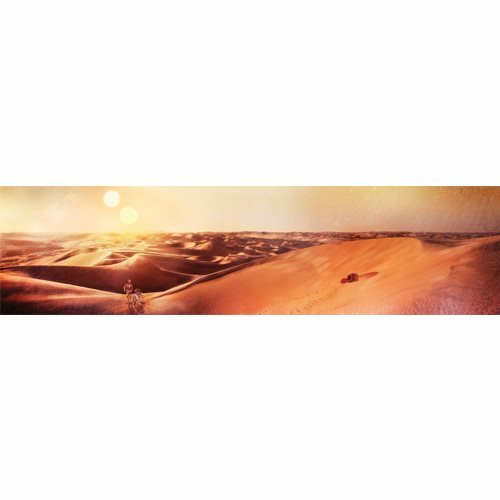 As the binary stars slowly set above the desolate desert planet of Tatooine, a lonely pair of droids, C-3PO and R2-D2, traverse the scorched sand in this sensational Star Wars Tatooine Sunset by Rich Davies Gallery-Wrapped Canvas Giclee Art Print. The unframed Star Wars artwork comes gallery wrapped around a 1 1/2-inch wooden stretcher bar, ready to hang on your wall (or give as a gift). It's a hand-numbered limited edition of just 195 pieces that measures 29-inches wide x 7 3/5-inches tall and comes with a certificate of authenticity.